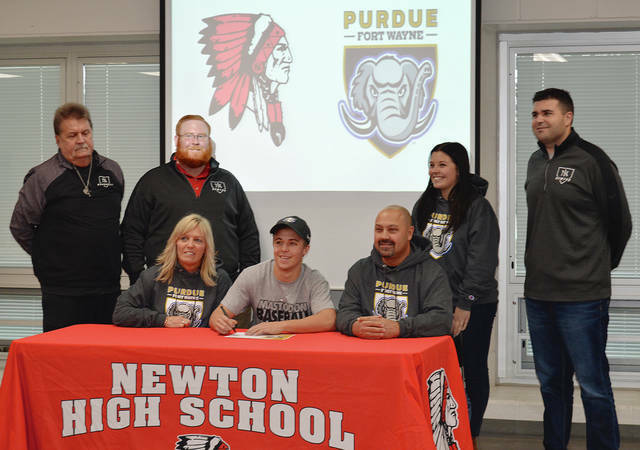 Rob Kiser|Call Photo Newton High School senior Ryan Mollette, the son of James and Tina Mollette, signs his letter of intent to play baseball for Purdue Fort Wayne as family and coaches watch. PLEASANT HILL — Newton High School senior Ryan Mollette had a dream from his early days. Mollette’s hard work — along with his athletic ability — made that dream a reality on Monday when he signed his letter of intent to play baseball at Division I Purdue Fort Wayne (formerly known as IPFW) with a number of his teammates and fellow students in attendance. And the son of James and Tina Mollette said the decision. And almost any athletic field has been the place at Newton for Mollette during his four year. He has excelled in multiple sports, with baseball being where he shined the most. His numbers speak for themself. As a junior, Mollette batted .515 with two doubles, three triples, a home run, 32 runs scored and 28 stolen bases. “Ryan (Mollette) is our leadoff hitter,” Newton coach Jordan Kopp said. “With every Division I player I have had, the one thing thing they have all had is work ethic. Ryan has a great work ethic. He is always working on his game and looking for ways to get better. For Kopp, it is always special when a player signs. Mollette was happy to see everyone who came for the signing — from coaches, teachers, family and students. And Kopp didn’t have any trouble pointing out what sets Mollette apart. And from the time he started playing, Mollette has utilized that speed in his game. Mollette hopes to make an instant impact with the Mastodons. And he was happy to be where he was Monday. “Definitely, it was worth all the time and hard work,” he said. To make his dream a reality. https://www.dailycall.com/wp-content/uploads/sites/30/2018/11/web1_mollette.jpgRob Kiser|Call Photo Newton High School senior Ryan Mollette, the son of James and Tina Mollette, signs his letter of intent to play baseball for Purdue Fort Wayne as family and coaches watch.